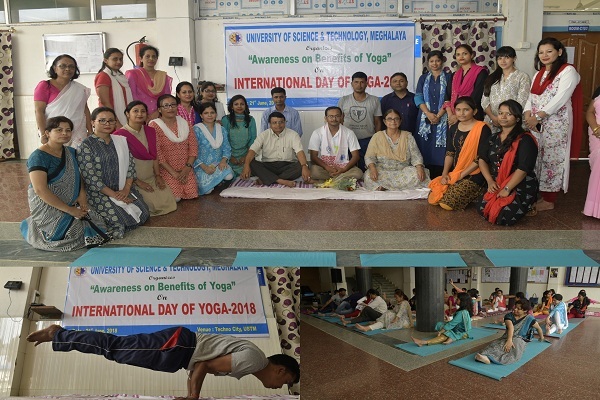 9th Mile, Baridua, USTM, 21 June 2018: The International Day of Yoga has been celebrated at USTM today by students, faculties and staff members of the University. The event was organised under the initiative of the Department of Physiotherapy, USTM. Renowned yoga instructor Mr Sunit Sharma was present on the occasion and demonstrated several yogasanas. The theme of the event has been, "Awareness on benefits of Yoga". Dr Pooja Choudhury, Head of the Department of Physiotherapy, USTM said that yoga is practiced regularly in the University and the celebration of the Yoga Day holds much significance as it spreads awareness regarding the numerous benefits of yoga both for the body and the mind.